Cambodia’s government is investigating the employment status of Chinese nationals operating businesses in Sihanoukville province, Interior Minister Sar Kheng said Monday, amid complaints by local residents who say they are losing work to the immigrants. Even as the European Union readies to visit Cambodia this week to decide whether the country should be removed from a preferential trade scheme due to lack of political reforms, Prime Minister Hun Sen is trying to enact two laws that could further stifle online speech, a move certain to rile EU negotiators. Keo Rattanak, Minister attached to Prime Minister and Director General of EDC, confirmed to Fresh News Monday that a new 150 megawatt coal-fired power plant in Sihanoukville’s Stung Hav will launch in September 2019. Cambodia has introduced a national strategy to handle money laundering and terrorism financing to further enhance social stability and peace. National Election Committee (NEC) has endorsed seven political parties to join the incoming Election of the Capital, Provincial, Municipality, District, and Khan Councils. A court has issued arrest warrants for top Cambodian opposition politicians living abroad, as the exiled activists began preparations to return to the country. Prime Minister Hun Sen has called on the Cambodian Labour Confederation President Ath Thorn to stop urging garment workers to protest and demand indemnity payments. People suffering from the drought in Preah Vihear province have begun drinking water from ponds and rivers. Health officials have called for them to properly boil the water before consuming. Five more former opposition leaders of the dissolved Cambodia National Rescue Party sent letters to Ministry of Interior requesting to re-enter politics, Interior Ministry spokesman Khieu Sopheak told Fresh News Monday afternoon. Prime Minister Hun Sen on Saturday announced plans for a bridge across the Tonle Sap lake to connect Kampong Chhnang and Kampong Thom provinces, a project that will bring about sizeable economic benefits. Equinox, the sun rising over the central tower of the Angkor Wat Temple in Siem Reap province, is forecasted to take place this year on Mar. 21, according to the APSARA Authority in charge of the protection and management of Angkor and the Region of Siem Reap. Sam Rainsy, the “acting president” of the Supreme Court-dissolved Cambodia National Rescue Party (CNRP), has written a letter to the European Commission ahead of the visit of an EU “Everything But Arms” delegation this week. Prime Minister Hun Sen has ordered all district governors in Phnom Penh not to take part in his public gatherings and should focus more on their daily works to deal with all issues. Construction on the planned Phnom Penh to Sihanoukville express highway is set to commence on March 22. Cambodian Prime Minister Hun Sen urged president of the Coalition of Cambodian Apparel Workers’ Democratic Union Ath Thun to stop pushing workers to demand employers the seniority indemnity as a lump sum for one year, addressing at the graduation ceremony of Institute of New Khmer Generation at National Institute of Education on Monday. African swine fever has spread to parts of Vietnam that border Cambodia’s Ratanakkiri and Kratie provinces, a Ministry of Agriculture, Forestry and Fisheries official said on Friday. Minister of Interior Sar Kheng on Saturday urged local authorities to stamp out drug crime, something he said had now spread to some rural areas. Cambodian Prime Minister Hun Sen has repeatedly appealed to all citizens to be patient about the issue of power cut and water crisis in some areas in Phnom Penh and provinces, addressing at the graduation ceremony of Institute of New Khmer Generation at National Institute of Education on Monday. Prime Minister Samdech Akka Moha Sena Padei Techo Hun Sen of the Kingdom of Cambodia has encouraged the youth to further pay attention to vocational training. Cambodian Prime Minister Hun Sen urged the Ministry of Justice, relevant institutions, and his lawyers team to speed up the trials of female detainees and pardon pregnant women in jails, addressing at the graduation ceremony of Institute of New Khmer Generation at National Institute of Education on Monday. Interior Minister Sar Kheng on Saturday urged people, especially those living in remote areas, to report cases of drug trafficking if they come across them. The Preah Sihanouk provincial court has placed seven people in pre-trial detention and is questioning four other suspects for their alleged leading roles in grabbing state and private land by illegally planting boundary markers. Can ride-sharing apps empower Cambodian women? Chheng Dani’s six-year-old son was growing restless in the passenger seat of her taxi as she snaked through traffic on Phnom Penh’s Preah Suramarit Boulevard in a race against the clock to deliver passengers to their destinations recently. Ky Tech, lawyer of Prime Minister Hun Sen, filed a complaint against Sor Chandeth, former Sam Rainsy Party senator, for insulting and inciting against Premier Hun Sen, according to Tech’s lawsuit Fresh News received on Monday. Cambodia is now laying the foundations of a successful digital economy but more needs to be done to ensure the Kingdom is not left behind in a world where technology plays an increasingly important role, Cambodia’s deputy prime minister said yesterday. French Fortnight in Phnom Penh starts from today and will run until Mar. 30 to showcase a wide range of cultural, scientific and economic activities. The incident took place at 7:38 pm on March 17, 2019 at the front of the “we” brand phone shop along Street 294, near Kakkor Market in Tonle Basak District, Chamkar Morn District, Phnom Penh. . Hang Chuon Naron, the Minister of Education, Youth and Sport, on Sunday hailed the National Association of Cambodian Scouts (NACS) as an active non-profit movement that supports the Kingdom’s education system and successfully participates in voluntary activities, as well as implementing various projects aimed at connecting children and young people with local communities. 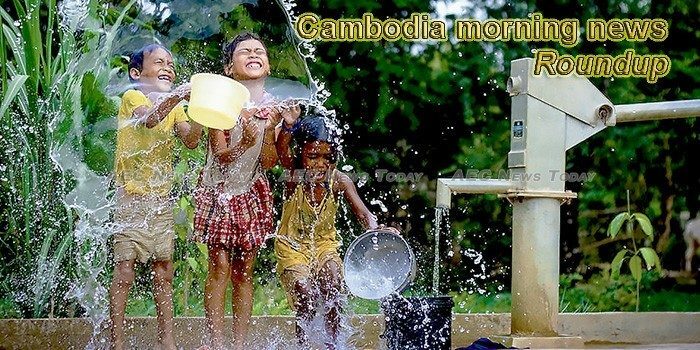 This week’s Cambodia morning news feature photo acknowledges World Water Day, March 22.